How is the big red car wash brush working out? Ben uses it occasionally...but has yet to fall in love with it. I like it. The water should be much cleaner and fresher and maybe cooler. Don & I have had good luck with float valves in our guzzler troughs. We protect them with heavy timbers held down by large rocks.I suspect Ben introduces a huge magnitude of potential damage to any float valve you might place in the area. Those long horns look pretty lethal! 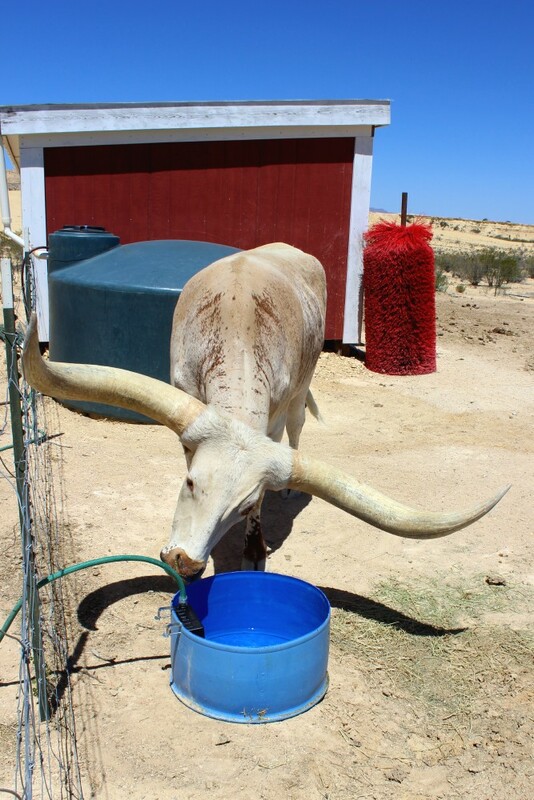 The largest animals we have watering are deer & javelinas - but most are birds of all kinds! Good idea Sam. That is one area animals usually cannot reach and so it is a favorite area to be petted or scratched. Why would Ben opt for an unintuitive stationary brush when he is in love with a perfect human brush nearby... Also it may be too soft, his thick skin may not feel it as much.